Saltwater Fishing Reels: Essential Equipment for Saltwater Fishing Success! To completely cover Saltwater Fishing Reels, we're going to start with Baitcast Reels, then hit Spinning Reels, and close with Fly Reels. If you're buying your first baitcast reel for saltwater use, my recommendation is that you go to an Academy or another local fishing store and spend $120 or more and buy a Shimano reel. The Citica is a good place to start at $120, and they go up from there. I've had nothing but good luck with Shimano products and haven't felt the need to switch or try something else. This will get you a good reel, not break the bank, and work well while Saltwater Fishing along the Texas Gulf Coast. My friends and I all got started by taking advantage of the Academy Rod and Reel combos. At this writing, they are offering a Shimano Citica reel and Castaway rod for $139.00. This is a great deal and way to get started with your Saltwater Fishing Equipment. In my opinion, you should spend more and place more importance on your Baitcast Reel than your Rod. This is because of the important function of your reel in casting your lure and hooking and fighting fish. Read on for more information on the Brands, Specifications, and Function of Baitcast Equipment. You'll spend a bit more for your baitcast reel than you will for your rod, and I believe it's a good investment. Your reel takes more punishment than your rod and has lots of moving parts. Saltwater fishing reels are made to withstand the harsh environment, and a quality reel will greatly enhance your experience. Your money here will be well spent. You'll generally find fewer brands of baitcast reels out there compared to rods. Shimano, Abu-Garcia, Diawa, Pflueger, Quantum, and US Reel are common brands. My advice is going to be more simple when it comes to reels. I've been using Shimano reels for years now and they've worked very well. My advice is you can't go wrong buying one. You'll spend more than $100, but I think it's worth it. If that's too steep I have another recommendation from a couple buddies who bought Quantum reels and have enjoyed them. They were in the $60-$80 range. Another manufacturer who has been around a long time is Abu-Garcia. I used their reels for bass fishing years ago, and was pleased. I haven't used one of their new saltwater versions, however, so I can't give you a recommendation. Diawa and Pflueger have also been around a long time. US Reel is a newcomer to the Baitcast game but I've been very pleased with my spinning reel from them. You find four major specifications on the Baitcast reels you find. The first is right or left hand retrieve, or which hand you reel with. Most right handers will use a right hand retrieve and left will use left. I'm right handed and have never shopped for left hand, but I would guess there are fewer left hand retrieve to be found. The next spec you will see is the line capacity. This will be listed by the number of yards for common line pound-test ratings. For example, 8/180 – 10/155 – 14/110 means that your reel will hold 180 yards of 8 lb. Test, 155 yards of 10lb., and 110 yards of 14 lb. You'll want the capacity to hold at least 100 yards of line in the pound test you commonly use, and 150 is better. Next will be the gear ratio which directly relates to the amount of line you'll retrieve per turn of the handle. For example, the two specs listed on the Shimano Curado 200E are 5.0:1 and 7.0:1. The lower the gear ratio the less line per turn. For this example, the 5.0:1 retrieves 21” per turn and the 7.0:1 retrieves 30”. My thought here is to go with the higher ratio. You can always slow your retrieve but there will be occasions when you'll want to bring in line as quickly as possible and it will be nice to have a higher ratio. The last will be weight in ounces. The lighter the saltwater fishing reel, the less fatigue you'll experience. And the lighter and smaller the reel the easier it will be to cradle in your palm as you work your lure. Lastly, some reel designs will be “low profile”, meaning they sit low on the rod's reel seat and are easier to palm. The “round profile” are a little less convenient. My take is to go with the low profile. Baitcast reels hold your fishing line under tension. This tension is adjustable, and controlled by two knobs. The knob attached to the handle with spokes controls the tension, also called drag, when the reel is engaged and you're fighting a fish. The smooth knob beside the handle controls tension when the button is pushed and the line is free when you cast. These adjustments are important for the successful and efficient use of baitcast equipment. The smooth tension knob beside the handle is important when casting because it helps you cast the greatest distance while still preventing backlashes. Here's how you make sure it's adjusted properly: Reel up your lure all the way and hold your rod up at about a 45 degree angle. Get your right hand on the tension knob and with your left thumb punch the button. When adjusted properly, your lure will fall at a slow, controlled speed. It's a good idea to check this after you tie on your first lure of the day and then when you switch to something with a different weight. You'll be able to cast a long way and prevent a backlash that could keep you occupied for five or ten minutes, keeping your lure out of the water. The knob attached to your handle with spokes controls the drag. This is the tension your line is under when your reel is engaged and you are reeling in a lure and fighting a fish. This adjustment is important so you can land your fish quickly while protecting your line from too much strain and possible breakage. Here's how to make sure it's adjusted properly: Grab hold of your line above your reel and put ever increasing pressure on it. Before it starts to hurt your hand because the line is digging into your skin you should be able to engage the drag and start pulling out line. On the average sized trout and flounder along the coast, your drag probably won't be engaged. Put another way, these fish won't be “taking line”. 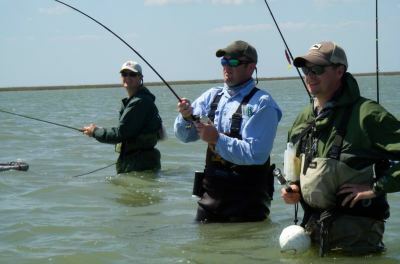 But get a decent sized redfish, large trout, or large flounder on and you might start seeing some line being taken out. There are few prettier sights! You know you have a big fish on! And here is where your drag will be protecting your line and at the same time fighting the fish and tiring him out. If your drag is set too tight then your line will be put under a lot of pressure and you risk breaking the line and losing the fish. Big Bummer! And if your drag is too loose then the fish will be taking a lot of line and making the fight longer than it should be. You can adjust your drag while you are fighting the fish, but it's a little awkward. Best to adjust it best you can and then readjust between casts. Fishing Story Break with Picture! You can also find yourself attached to what feels like a freight train! While making our final wade of the day my buddy Travis got hooked up with a fish that immediately started taking line. He barely slowed him down and was quickly getting down to his spool and the end of his line. He used his thumb to increase pressure on the spool and make the fish work but had no luck. If you're buying your first spinning reel for saltwater use, my recommendation is that you go to an Academy or another local fishing store and spend $100 or more and buy a US Reel or a Shimano. A few years ago I decided to buy spinning equipment, and at the time I read about some innovations by US Reel. It hooked me and I bought one. I've been really pleased and can recommend it if you're looking for a new spinning reel. My buddy that uses spinning equipment fishes with Shimano and likes their reels. I'm not surprised because they make really good baitcast reels, so based on that I recommend Shimano as well. Again, this will get you a good reel, not break the bank, and work well while Saltwater Fishing along the Texas Gulf Coast. In my opinion, you should spend more and place more importance on your Spinning Reel than your Rod. This is because of the important function of your reel in casting your lure and hooking and fighting fish. Read on for more information on the Brands, Specifications, and Function of Spinning Equipment. You'll spend a bit more for your spinning reel than you will for your rod, and I believe it's a good investment. Your reel takes more punishment than your rod and has lots of moving parts. Saltwater fishing reels are made to withstand the harsh environment, and a quality reel will greatly enhance your experience. Your money here will be well spent. You'll generally find fewer brands of spinning reels out there compared to rods. Shimano, Diawa, Penn, and US Reel are common brands. My advice is going to be more simple when it comes to reels. I've had good luck with my US Reel and have been using Shimano baitcast reels for years now and they've worked very well. My advice is you can't go wrong buying either one. You'll spend more than $100, but I think it's worth it. If that's too steep my recommendation is to buy a less expensive Shimano reel. I can't give you a recommendation on the Diawa and Penn Reels because I haven't used them and don't have friends that have either. Both of those companies have been around a long time, and maybe you know someone that has used them and can recommend them. You find fewer major specifications on Spinning reels compared to Baitcast reels. They are simpler in design, and cost a bit less for a higher end reel. For one, Spinning reels can be switched from Right to Left hand retrieve, so no decision has to be made there. The first spec you will see is the line capacity, and it works the same as with baitcast reels. This will be listed by the number of yards for common line pound-test ratings. For example, 8/180 – 10/155 – 14/110 means that your reel will hold 180 yards of 8 lb. Test, 155 yards of 10lb., and 110 yards of 14 lb. You'll want the capacity to hold at least 100 yards of line in the pound test you commonly use, and 150 is better. The next two will be the gear ratio and line retrieve per crank of the handle. The relationship here isn't as direct as it was with baitcast reels. Looking online at the US Reel specs, the gear ratio wasn't listed but the retrieve per turn was. I also picked a reel by Shimano and looked it up, and the gear ratios weren't directly related to the retrieve per turn. All this being said, my take is the same as it was for baitcast reels. If you get the choice, go with more retrieve per turn because it's easier to slow down your retrieve and you may find yourself needing to pick up line in a hurry. The last will be weight in ounces. The lighter the reel, the less fatigue you'll experience. You don't palm a spinning reel like you do a baitcast reel, but there is a similar difference we can discuss. Remember me talking about the innovation that hooked me on the US Reels? One was a large arbor, which is what your line is wound around on the reel. Their idea is that a larger arbor means less turns of the line because it's not wound as tight. This they say produces longer casts and reduces line twist. I haven't used another spinning reel so I have nothing to compare it to – but I will say that I haven't experienced line twist and I can cast it a long way. So they may be onto something! Spinning reels, unlike Baitcast, only hold your line under tension when the bail is engaged and you're working your lure or fighting a fish. This makes them a bit simpler to operate. The tension of the drag is adjustable by a knob on top of the spool. This adjustment is important for the successful use of spinning equipment when fighting a fish. The knob on top of the spool controls the drag. This is the tension your line is under when your reel is engaged and you are reeling in a lure and fighting a fish. This adjustment is important so you can land your fish quickly while protecting your line from too much strain and possible breakage. If your drag is set too tight then your line will be put under a lot of pressure and you risk breaking the line and losing the fish. Big Bummer! And if your drag is too loose then the fish will be taking a lot of line and making the fight longer than it should be. You can adjust your drag while you are fighting the fish, and it's a little easier to do with a spinning reel. But it's still best to adjust it best you can and then readjust between casts. Like backlashes with Baitcast reels, the thing to look out for with Spinning reels is line twist. A couple of things can help minimize line twist and help keep your lure in the water. Using a small swivel between your main line and your tippet is one way to reduce line twist. Using a 20-30 lb. Flourocarbon tippet is a good idea because of the rough saltwater environment. This connection is made easier when you use a small swivel. If you're buying your first spinning reel for saltwater use, my recommendation is that you go to a fly shop and spend $65 or more and buy a Ross Reel. My recommendation for fly fishing equipment is to spend the most on your rod and get a decent reel. Your rod and your casting skill are the determining factors. I've been using Ross Reels for years and they do a great job. You'll spend less for your fly reel than you will for your rod for the reasons I mentioned above. Your reel takes punishment from the saltwater just like other reels, but there are fewer moving parts and they are simpler to operate and clean. When it comes to fly fishing equipment, your money will be better spent on your rod. There are quite a few brands of fly reels out there, and there are many that are very impressive, well made pieces of machinery. The higher end brands out there are Tibor and Abel. They are beautiful, well made, and upwards of $500. I encourage you to take a look at them at your local fly shop and buy one if money is no object. When you get into the moderately priced brands, you'll find Orvis, Lamson, Bauer, Waterworks, and Sage. These companies have all been around for a while. I'll bet they make a good reel, but I can't say enough about my experience with Ross. Their starter reels for an 8 weight rod you'll be using along the coast start at $65 and go up from there. My advice, as I stated above, is to pick a Ross model. You'll be glad you did. You find fewer major specifications on Fly reels when compared to Spinning and Baitcast reels. They are simpler in design than each. Like Spinning reels, Fly reels can be switched from Right to Left hand retrieve, so no decision has to be made there. The first spec you will see is the line capacity when using the line weight the reel is designed to hold. For example, the Ross Flystart 4 lists capacity as WF8F & 200 yds. 20# backing. The WF8F stands for Weight-Forward size 8 Floating, and refers to the taper of the line, size, and whether it floats or not. By the way, this is the most common line and my recommendation for what you would use along the coast. The backing capacity of 200 yards of 20 pound is pretty standard and all you would ever need for reds, trout, and flounder along the Texas Gulf Coast. The next spec refer to the size of the spool. Just about every reel you will find out there has an enlarged spool called a “large arbor”. This keeps your fly line from wrapping tightly around the spool, reducing line memory, and allowing you to pick up more line per turn of the handle. This is the same concept we talked about with gear ratio and line per turn with Baitcast and Spinning reels. It's a good idea to have the ability to pick up a lot of line per turn. The last spec will be the weight of the reel. There isn't always a direct relationship between cost of the reel and it's weight. At the higher end you'll have more intricate and smoother drag systems and higher grade (but not necessarily lighter) materials. It's a good idea to have your reel when you're picking out your rod so you can feel how it is balanced when you cast. Fly reels are more simple than Spinning and Baitcast reels. They hold your line under tension if you or the fish try pulling it out. You'll be pulling it out before you cast or during our cast as you lengthen your cast and try to reach the fish. And hopefully you'll have a big red or another fish on the other end that will be tugging on your line as well! This pulling will be controlled by the drag, and the drag knob will be located on the opposite side of the handle on most reels. This adjustment is important for the successful use of fly fishing equipment when casting and fighting a fish. Here's how to make sure it's adjusted properly: You don't need your drag cranked down when fly fishing for reds, trout, and flounder. You'll be pulling line out before and during your cast so you want to be able to grab it, give it a good tug, and get some line out. When you're fighting a fish and he's “on your reel”, you can use your palm on the spool to slow him down or tighten the drag while you are fighting him if you need to. There's a good chance if you hook into a 24” plus red that he'll be taking some line – Congratulations! But you can slow him down using the rod to make him work, by palming the reel, or by tightening the drag. Baitcast and Spinning Reels play a more important role in your saltwater fishing success than do Fly Reels. They are also more intricately made and have more moving parts than Fly Reels. For this reason, my recommendation is that you spend more on Baitcast ($120 or more) and Spinning ($100 or more) and Fly ($65 or more) Reels. My recommendation on brands is Shimano for Baitcast, US Reel or Shimano for Spinning, and Ross for Fly Reels. Return from Saltwater Fishing Reels to the Saltwater Fishing Equipment page. © 2015 Saltwater-Fishing-Texas.com. All Rights Reserved Follow the link to contact us here at Saltwater Fishing Texas, Where We Join You in the Quest for Saltwater Fishing Success!